MASKerade: QFTD139 - Casing Gabby! I have never played along with Splitcoaststampers' Queen for the Day challenge before. I didn't even really understand what it was, but this week's Queen is my friend Gabby (Gabalot on SCS), and I wanted to honour her by playing along. I used an Impress line of snowflakes, a snowflake die (sorry, I don't know who makes it, but the metal is coated in paint that is kind of bashful blue in colour, if that's any clue) and a Stampin' Up! sentiment. And lots of Stickles, to make the snow sparkle. 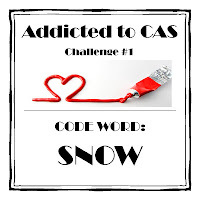 I will also link it up to Addicted to CAS #1 - Snow and CASual Friday, Winter Blues. Tomorrow's our next CASology Cue Card - and it's a fun one! See you at 9:00! Gorgeous shade of blue, and I love the snowflake diecut. Gorgeous Ardyth. Love the soft blues and the touch of glitter. Thanks so much for playing with us at CAS-ual Fridays! Purefect CASE, Ardyth. And awesome in the thumbnails at ATCAS as the definitive CAS card!! This is a really pretty snowflake punch! Perfect for tucking in rows of text, images, etc. between the "spokes/fingers/v's"...(haven't got a clue what they are really called). Love the card Ardyth - somewhat addicted to dies these days. I don't know for a fact, but your description sounds like a Cheery Lynn die to me. They make a lot of snowflake dies and the pastel painting is just the way they make them. Gorgeous use of the negative die cut image and I love the sentiment in the centre! I love this soft blue and the beautiful big snowflake with the row of smaller ones behind it! Beautiful, Ardyth! Wow, a perfect example of a striking CAS card. I love the soft colors too. Thanks for playing at CAS-ual Fridays! This is the perfect CAS card. I just love everything about it! Thanks for playing at ATCAS!